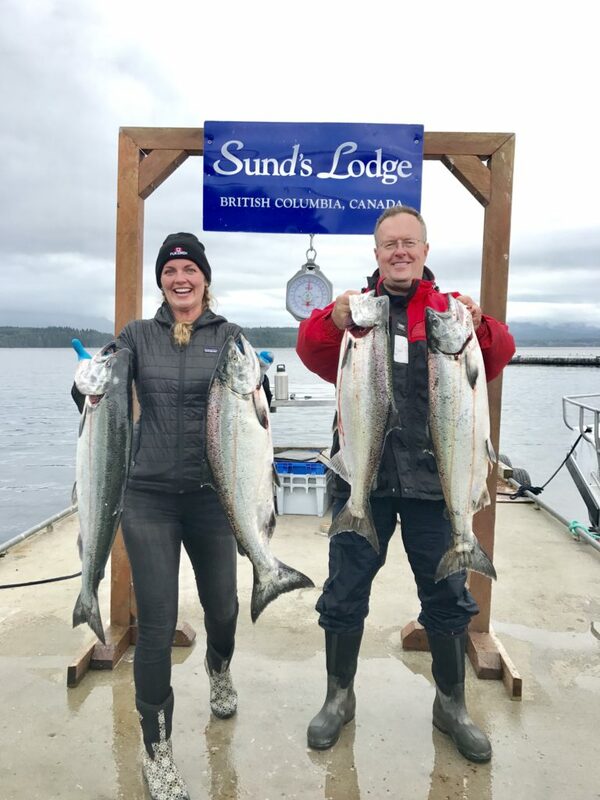 Sunds Lodge is located in a prime location on the northern part of the Inside Passage of Vancouver Island where Pacific salmon are abundant. 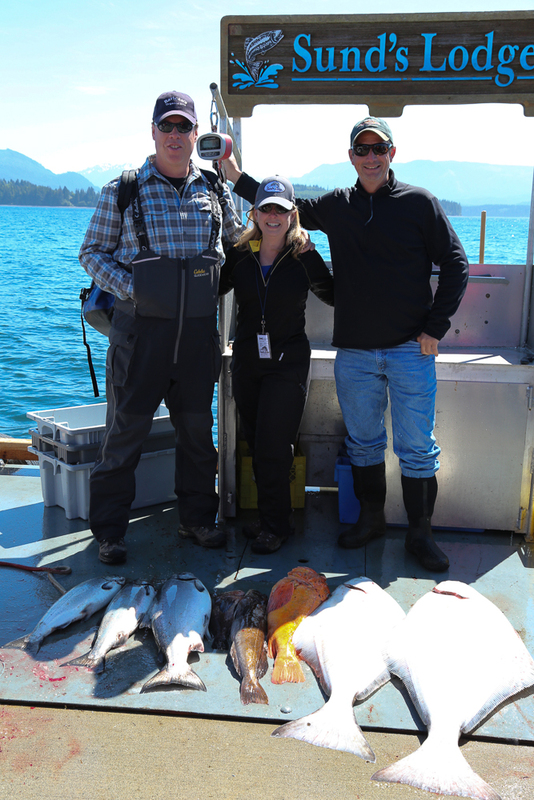 We fish for all five species of salmon, halibut and cod, all within minutes from our dock. The calm, protected waters of Blackfish Sound offer one of the most abundant fishing areas on the British Columbia Coast. 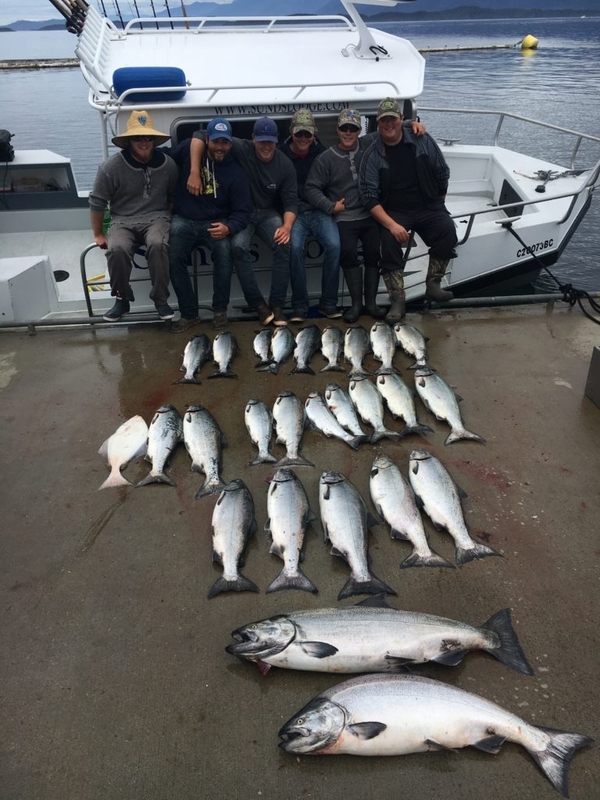 After battling a Chinook salmon in the 20 to 40 pound class, we can limit out on a 12 to 16 pound Coho or beautifully fighting Chum, Sockeye and Pink Salmon. After a hearty breakfast, you’ll board the fishing boat with your guide to head out to catch the coveted King Salmon which tend to bite at first light. You will spend your your day trolling for salmon or jigging for halibut, cod, rockfish or black bass. This is luxury fishing. Even if you don’t know how to fish, our guides will teach you the basics on how to reel in your salmon. If you are an experienced fisherman, you’ll enjoy doing as much of the work yourself as you want. The guides set the line and down-riggers with bait or lures, setting them to the optimum depth to catch fish. Once there is a bite on the line, your guide will set the hook and give you the rod to reel in your catch. There’s an excitement of fighting with and reeling in that first big fish, one that you can only experience first-hand! Your guide nets the fish and brings it into the boat so it can be bled and instantly chilled on ice and water to provide the best flavor of the fish for when it is prepared when you get home. Jigging is a totally different experience from trolling, and the bottom-fish are caught by a weighted line which requires more participation than trolling. Your guide will teach you the fundamentals of how to jig so you can reel in that coveted halibut from the ocean floor. What an incredible experience to reel one of those into the boat after fighting it from the depth of 300 feet! Our fleet consists of six 23’ Aluminum Chambered Boats that are generally regarded as the safest, most comfortable fishing boats on the market. The boats have fully enclosed cabins and private bathrooms for your comfort. We fish 3 to 4 anglers per boat, depending on groups traveling together. Private boats for 2 anglers only can be arranged for an additional fee. All of our boats are equipped with state of the art Lowrance Radar, GPS, and depth sounder units to make sure you can find the fish and stay on top of them. The boats get new Yamaha engines every two years to ensure no breakdowns. We use Lamiglas 10’6 light-medium salmon trolling rods and 6’ Lamiglas halibut jigging rods, both with Shimano reels. We know you will find our equipment impeccably maintained to create a fun and quality experience that can’t be matched. Guests can either release or catch and harvest their fish within British Columbia tidal water limits. Your guide will brief you on catch limits. You may visit the current British Columbia regulations guide if you are interested in learning more about the regulations for fishing in Area 12. Every day when fishing is complete, we’ll take pictures of your fish and weigh in your salmon or halibut for bragging rights. Our team will then cut and filet your fish, piece into smaller chunks, wash with fresh water and vacuum pack and freeze. Upon departure from Sund’s Lodge, we’ll load all the fish you caught into a waxed box for the ride home. Your fish boxes can be checked as luggage on your commercial flights. The frozen fish serve as insulators in the waxed box and the fish are kept safe as they travel around the world. In the last couple years fish caught at Sunds Lodge have flown to France, Norway, Bahrain and Australia! Fish filleted, frozen and prepared for the trip home.